One important trend that all small businesses should recognize is the importance of improving employee engagement at their workplace and the role IT can play in achieving this goal. In this blog post, we will explain what employee engagement is, why it’s important, and how your small business can use IT to improve the employee experience at your company. Employee engagement is defined as the amount of passion, loyalty, commitment, and attachment an employee has for their company and for their unique role at the business. Studies have proven that the higher the level of employee engagement there is at a company, the more satisfied and productive the workers are. A recent Gallup poll found that only 34% of employees considered themselves “actively engaged” at their company. Nearly 17% were “actively disengaged,” meaning they had a miserable work experience, and the rest considered themselves “not engaged.” The not engaged workers felt generally satisfied, but they were not cognitively or emotionally satisfied with their job or their employer. Importantly, these results showed that the majority of workers will do only the minimum required to keep their jobs and will quickly leave their company for only a slightly better offer. Why is Employee Engagement Important for Your Small Business? A critical reason why employee engagement is important for your small business is that millennials have become the majority of workers and they place significant value on a positive and meaningful work experience. Millennials have recently been characterized as the “purpose over paycheck” generation. They will work long hours with maximum effort at their position if they feel valued and believe in an organization’s purpose. Conversely, they will not stay long in a position they see as meaningless or where their hard work is not appreciated. In a competitive job market, your company can distinguish itself from other businesses by recognizing this generational trend and responding to it. Your company will attract and retain higher quality workers by demonstrating the value you place on the employee experience and by keeping your workers actively engaged in the workplace. These impressive results demonstrate that the goal of improved employee engagement will bring about significant benefits for companies of all sizes. Technology influences all aspects of the employee work experience, so it is crucial that your small company understand how to effectively use it to best support employee engagement and performance. Some key steps your small business can take to improve employee engagement are described below. As noted earlier, millennials will increasingly make up your small company’s workforce and most of them are technologically adept. It is important to offer the latest devices, programs, and solutions to these employees, especially those that enhance remote working options. Flexibility and a blended work-life balance are important features that millennials consider when either determining a prospective employer or deciding to stay in their current position. Millennials will also be well versed in a wide variety of technologies that can improve different aspects of your operations and are valuable resources that should be routinely consulted on these matters. One key factor that millennials emphasize is their desire to use IT to free them up from monotonous tasks, so that they can perform work that is more meaningful. 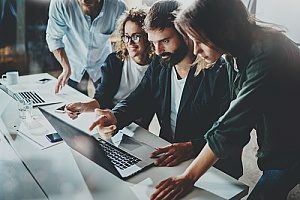 Your company should work with your millennial employees to identify and implement software and solutions that can perform mundane tasks better than humans can. Millennial employees feel more engaged with their companies when they know they are adding value and making a significant contribution to the organization’s mission. A recent PWC survey revealed a disturbing disconnect between executive leadership and employees. An impressive 90% of leadership positions insisted that their companies consider their employees needs when purchasing and introducing new technologies. However, only 53% of the employees in the same survey agreed with that statement. 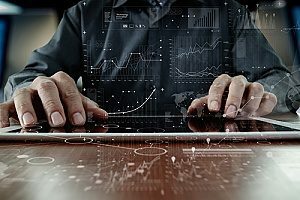 Before purchasing or installing any new technology it is important for executive leadership to work with employees to understand how the proposed solution will fit in and improve the workflow of the organization. Your company should encourage frequent communication from employees as you ask them for vital feedback on the best use of IT. Key questions to ask include how they currently use technology in their positions and what new technology options would improve their work experience and help achieve company objectives. Once your small company has identified the relevant IT needs of your employees, it is also important to ensure that your staff is properly trained on how to use the latest technological tools. The PWC survey revealed that only 50% of employees were satisfied with the resources their companies provided for technology training. Your employees will appreciate having sufficient training resources available to smoothly transition into the use of new technologies. Even though employees increasingly desire more remote work options and less micromanagement, they also have the need for more human contact and communication. 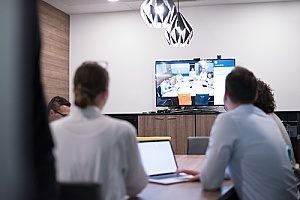 In addition to offering more actual meetings and events, your small company should invest wisely in the most effective collaborative technology solutions to encourage greater collaboration at your workplace. Better communication leads to more collaboration as well as a greater sense of belonging to a unified team. In addition, it is important for leadership to consistently utilize technology to recognize and acknowledge the efforts of employees individually and companywide. The O.C. Tanner Learning Group recently found that 79% of employees who quit their jobs cited a lack of appreciation as the main reason for their departure. In addition, 65% of employees reported that they were not recognized once in the last year by management. Regular emails, conference calls, regular and virtual meetings, and a well-maintained company newsletter will help your company achieve the important goals of enhanced internal communication, more productive collaborative efforts, and the improved acknowledgement of employee achievements. Your small business will be a more enjoyable and productive place to work when employees communicate and collaborate more frequently and know each other better. For assistance in using IT to improve employee engagement at your small business, we recommend you consult with a trusted IT Support Provider like Network Depot. An experienced and knowledgeable IT partner will help your small company effectively plan to achieve this objective and will assist you in successfully carrying out your efforts in this vital area.